All the tips, ideas and advice that you’ll need to eat healthily, from the world’s best chef and a worldrenowned cardiologist. This book is a profound reflection on our relationship with food. The reader will learn how to eat better not only through the information provided – information which they could get from any textbook– but also because they’ve been asked to think hard about how they eat. The book has a narrative format following a family of six through twenty four hours. It maps out a typical day in family life, a Saturday for example, with successive chapters covering breakfast, shopping, food preservation, cooking, the food itself, etc. 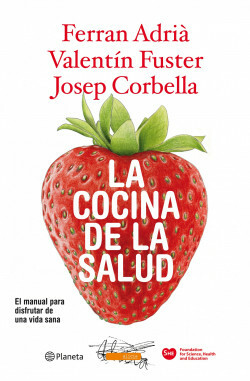 La cocina de la salud offers the reader health and food tips by the pen of two world specialists in their own fields. This book has many practical advices, recipes for everyday cooking, ideas and solutions for cooking, together with many sorts of recommendations and curious information.